This 7.62x39mm ammunition from Tula is a particularly good choice if you want to hunt with your AK or SKS rifle, though it is inexpensive enough to use on the range as well. These cartridges fire relatively heavy bullets that deliver better penetration than those of mil-spec weight. 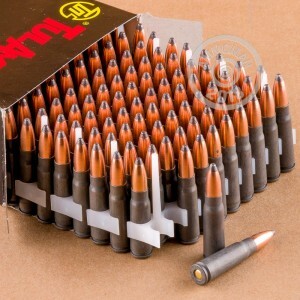 Each cartridge in this box of 100 fires a 154 grain soft point bullet at a muzzle velocity of 2,051 feet per second. The soft point bullet delivers high diameter expansion without fragmenting and destroying excessive amounts of meat. 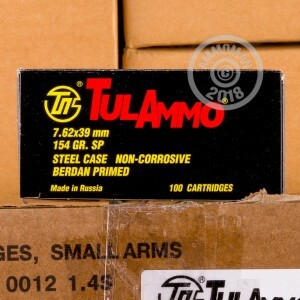 Tula ammo is loaded in Russia using reloadable brass cases and non-corrosive Berdan primers.